Jape now works on Tiger (Apple's Mac OS X 10.4). Dr. Bornat sent me a new version compiled by his collaborator, Bernard Sufrin, and it worked fine. I assume jape.org.uk will soon add this version for download. Two introductions to Jape are the guide to using Jape with natural deduction (PDF from the Manuals section of the Jape home page), and his 2005 book, Proof and Disproof in Formal Logic: An introduction for programmers (Oxford University Press). I've also gathered together some of my own notes into an article entitled (unsurprisingly) Jape Notes. Jape wouldn't work on my Intel MacBook Pro (vintage ca. 2006) running Tiger (not its Leopard successor). 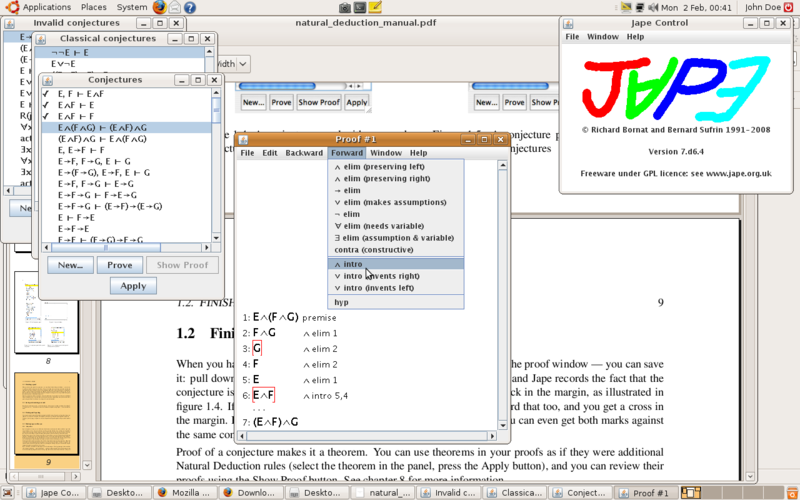 It's not a critical issue for me as I can run it on Linux using the VirtualBox emulator. See Jape Installation from a more free-ranging wiki of mine for more details.